Marlee Starliper wasted little time transitioning from cross country mode to track mode. Starliper, of Northern, went up to New York a week removed from her 13th place finish at Foot Locker XC Nationals, and ran the nation's fastest mile of the young indoor season. 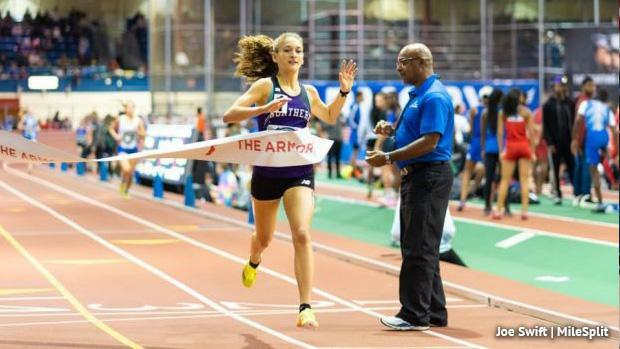 Starliper ran away with the win in 4:47.21 at the Armory Coaches Hall of Fame Invitational at the Armory, using that XC fitness to propel her to a quick time. Her time, a PA#1 and US#1, broke the Hall of Fame Invite meet record by over 5 seconds. She bookending her race with 34 second laps on the 200 meter oval and consistently running mid-36 second splits, as she managed to pull away from second place Lily Flynn of Ursuline School (NY) a little after the midway point. It's not a PR for the reigning PA indoor mile state champ, who ran 4:43.49 at Penn State last year, but it's still a tremendous start to her junior season on the track. Isabelle Goldstein of Germantown Academy was also in the field. The junior placed fifth in 5:09.44. State College's Kileigh Kane took 11th in 5:15.17. According to the MileSplit database, Starliper's time is the fastest ever time run in December by a high school girl.